History – Turbomess: The L-410 Turbolet Family Tree | Achtung, Skyhawk! In one of those instances in life where innocent scrolling through aircraft photos leads to several hours’ worth of research, I am once again able to present one of my (unplanned 😀 ) historical works, borrowing now on a theme set by my previous PC-6 engine piece. The unsuspecting party this time is the pudgy Let L-410 Turbolet, one of the Czech Republic’s most notable and successful aircraft – and a machine that many in Eastern and Southeastern Europe associate with durability, practicality and robust versatility (alongside the An-2 naturally). All aboard! 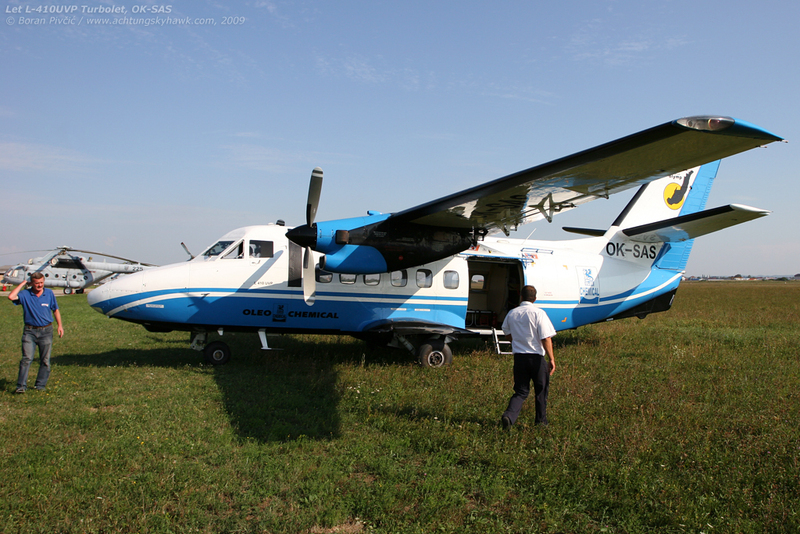 One of the several Turbolets to have visited Lučko over the years, OM-PGD is by far the rarest, being a member of the “early” L-410M family – nowadays quite an unusual sight. Despite its apparent complexity though, the classic L-410 line can actually be split into only eight easily-manageable families. Given that various online sources give various specs and details for each generation, I’ve decided to go back to the absolute basics, and concentrate solely on the one definitive source – the Turbolet’s Type Certification Data Sheet (or TCDS), available both from the Czech Civil Aviation Authority and EASA. But, since fiddling with the sort of detailed specs that can be found in such a document would defeat the purpose of a “clarification”, the aim of this article is simply to construct an overview of the general changes from family to family – and not a thorough analysis of all 39+ versions. To keep the comparison clean, tidy and understandable, only the bits that were changed between models are noted – with an exact side-by-side comparison of key performance specs and characteristics (also my own work) provided at the end. L-410 “originals” (6 aircraft): despite the Turbolet being most closely associated with the Walter M601 series engine, the type’s beginnings were actually tied to another turboprop great, the Pratt & Whitney Canada PT6A. While the L-410 had been designed from the outset with the M601 in mind, the engine was still not usable by the time the Turbolet was nearing the detail design stage in the mid-60s. In order not to hold up development, the Let works had soon decided to slot in a replacement engine, the PT6A-27, developing 680 SHP. Given that engine-propeller combinations are not really open to experimentation, the choice of a Western engine had necessitated the use of a Western propeller, in this case the Hamilton 23LF-343 three-blade unit with a 2.6 meter span. Following flight and ground testing of the four XL-410 prototypes, the design was finally “frozen” at the beginning of the 70s, subsequently entering production in 1971 as the L-410. However, only six aircraft of this series were ever produced – with all having subsequently been converted to the L-410A standard. An interesting detail – first seen on the final two prototypes – was the de-icing system, which had dispensed with standard pneumatic boots in favor of a TKS fluid system. Increasingly popular on today’s high-performance GA aircraft, this system works by bleeding a special glycol-based fluid through micro pores on the wing and tailplane leading edges, preventing the accumulation of ice. While the system is significantly more effective than classic boots, the protection provided is dependent on the quantity of fluid carried – a factor that had limited the aircraft’s exposure to icing conditions to only 40 minutes. L-410A (25 aircraft): picking up where the original left off, the A model was introduced at the beginning of 1972, but had essentially differed only in the propeller fit – with the Hamiltons giving way to Hartzell HC-B3TN-3D units with the same three blades and 2.6 meter span. Interestingly, some sources state that this version had also introduced a Maximum Take Off Mass (MTOM) increase to 5,700 kg from the original’s 5,400 kg; however, the TCDS states that both the original and A models were certified for the higher mass. L-410M (108 aircraft): by the mid-70s, the M601’s bugs had finally been ironed out, making it suitable for installation on the Turbolet. Debuting in 1975, the M would be fitted with the increased-diameter M601A unit, developing 740 SHP and whirling three-blade Avia V508 propellers with a 2.5 meter span. Despite the increased power, this new setup had actually had a slightly detrimental effect on performance, with cruise speed now reduced by 10 km/h / 5 kts to 350 km/h / 189 knots, and ceiling by 100 m / 300 ft to 6,000 m / 19,700 ft. The switch to the M601 had also marked the end* of the TKS de-icing system and the return to standard pneumatic boots, resulting in the lifting of the 40 minute restriction for flight in icing conditions. L-410UVP: as was the case with many Eastern European aircraft, the Turbolet’s main market was – by default – the USSR, especially in the hands of the state behemoth Aeroflot. Having originally instigated the development of the L-410 as a potential substitute for the vast fleets of An-2s still being used on commercial services, Aeroflot had naturally been interested in getting the most out of the design, having had some reservations about the M model’s ability to operate in the Soviet backwoods. Under the airline’s urging, Let had in 1979 introduced the improved UVP, whose primary claim to fame was full STOL performance (with UVP being short for ukorochennovo vzlyota i posadki, or “improved take-off and landing” in Russian). While at a glance it looks just like its predecessors, this new model is in fact a somewhat larger machine, sporting a 0.8 meter fuselage stretch (for a total of 14.17 meters in length) – and, critically, a 2 meter increase in wingspan to 19.48 m. Fitted with a pair of ground spoilers to dump lift on landing, these changes were in theory all that was needed to achieve the required short-field performance. However, all these mods had also resulted in a significant increase in empty weight, which – without an appropriate increase in MTOM – had led to a reduction in payload (despite the extra room on board). Further complicating matters was the revised powerplant, now taking the form of the 700 SHP M601B and its associated Avia V508B propeller – making for an 80 HP deficit at take-off. This problem would be mitigated somewhat in 1983 with the introduction of the 735 SHP M601D and Avia V508D – as well as Service Bulletins which, when implemented, allowed an MTOM increase from 5,500 to 5,800 kg for the M601B and 6,000 kg for the M601D. Despite this, the added bulk (and re-certification to Soviet standards) had also resulted in a reduced ceiling of 4,250 m / 14,000 ft, and a reduction in passenger capacity from 19 to 15 (not even swapping the metal rudder for a fabric-covered one had helped bring the weight down). L-410UVP-E: to cure the UVP’s ills, the Let works would in 1986 debut the further improved UVP-E (E for ekonomicheskiy, or “economic”), also known briefly under the tongue-twister L-410UVP-L-E. This would be fitted with the 760 SHP M601E or E-21 engine (the latter intended for hot-and-high operations), spinning more substantial Avia V510 five-blade propellers with a 2.3 meter diameter and fully automatic autofeather system. Even though cruise speeds had remained the same as on the M and UVP, the new aircraft could boast significantly higher maximum weights, with an MTOM of 6,400 kg and a Maximum Landing Mass (MLM) of 6,200 kg. Apart from regaining its 19 passenger capacity (in part due to the reconfiguration of the rear baggage compartment), this version had also introduced optional tip-tanks, which together added 315 kg of fuel to its basic 1,000 kg internal capacity. Other changes had also included a revised avionics setup, now fully compatible with both Western and Eastern ground navigation aids – as well as the reintroduction of limitations for icing conditions, with the E now restricted to low and moderate icing down to a minimum temperature of -20 degrees Centigrade. The reason for this turn of events is somewhat uncertain, but was suggested to be due to the design of the oil-to-fuel heat exchanged fitted to this model, which could lead to the overcooling of both the oil and fuel in extremely low temperatures. L-410UVP-E20: what would eventually become the definitive classic Turbolet had appeared in 1990, sporting only a 40 cm fuselage shrink and a (once again) restored ability to continuously operate in icing conditions (likely due to the removal of the offending heat exchanger). While this had hardly set the world alight, the changes “on paper” were much more significant, with the E20 being the first of the family to be fully certified against both FAA FAR 23 and (today’s) EASA Part 23 regulations. Being “universally accepted” in the world had also meant that the E20 would remain in production until this day, with examples still being delivered left and right at the time of writing. L-420 (one aircraft): the last of the Turbolet classics, the L-420 also had the dubious distinction of creating confusion far greater than its “production run”. Introduced in 1998, the 420 was often labelled as just a re-branded E20; however, in reality, the model was actually another refresh of the E line, intended for certification and export to the US market. Sporting 790 HP M601F engines driving the same V510s, the 410 could boast a top speed of 375 km/h / 202 knots and an “A level” ceiling of 6,100 m / 19,700 ft. Interestingly, the aforementioned FAR regulations had necessitated a number of unusual changes to the basic design, including the removal of the engines’ Integrated Electronic Limiter Unit (IELU) – which would reduce engine power in case any of its parameters were exceeded – the addition of a passenger door on the right side of the fuselage (identical to the one on the left) and reinforced flight control linkage. Despite the increased performance and the additional changes, the design had not fared well against Western competition, with reportedly only one aircraft made – and a test conversion from a stock E20 at that (though it is now normally flying in commercial operations). L-410NG – the new kid on the block: even though this one doesn’t count towards the classic family tree, I’d decided it would be unfair to skip over it – especially since it picks up the baton of the L-420. Having flown for the first time in 2015, the NG is essentially a thoroughly updated current-production E20, marketed (ironically) primarily to operators in the former USSR. The highlights of its transformation include a three-screen Garmin G3000 glass cockpit, composite materials in non-critical areas (such as doors), an elongated nose for increased baggage space – and a significant power boost in the form of the 850 SHP General Electric H85-200 unit and its associated five-blade Avia AV-725 prop. While the latter sounds like quite a development, the engine in question is actually a thoroughly modernized M601, born during GE’s purchase of Walter. The extra grunt naturally promises increased performance and capability, with an MTOM of 7,000 kg, MLM of 6,800 kg – and cruise speeds now in the 420 km/h / 227 knot range. Interestingly, the update also includes a significant boost in fuel capacity, with 2,340 kg now available with tip tanks, versus 1,315 for an equivalent E20. As always, I would like to extend my sincere thanks to former L-410 F/O Enes Handžar, who had shed a lot of light on the Turbolet’s history and quirks!